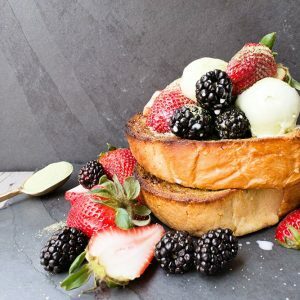 Living in California, it seems like our summer is year-round, which can be a plus and negative at the same time. I miss waking up to chilly mornings and putting on layers of sweaters. 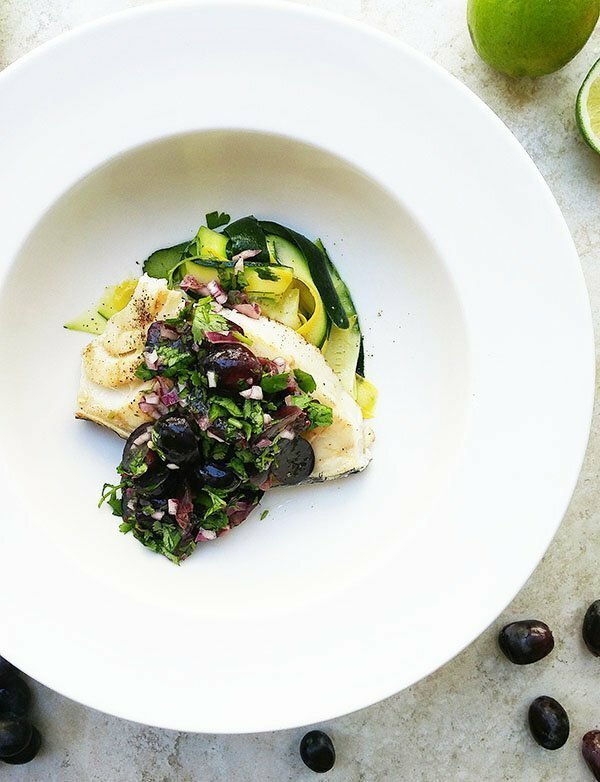 On the plus, I can enjoy dishes that seem only appropriate for summer year- round like this grilled sea bass with grape salsa and zucchini and yellow squash salad. 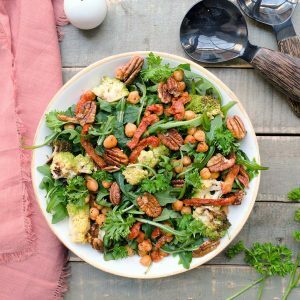 If you’re looking to “detox” after all the meats from the Fourth of July this past weekend, this meal is the perfect one to prepare. It’s light, refreshing but still very satisfying! Prepare the grape salsa. Combine the grapes, cilantro, red onion, and lime juice, stirring to coat well. Season with salt and pepper. Set aside. Prepare the dressing for the zucchini and squash salad. Whisk together white wine vinegar, olive oil, garlic, and sugar. Season with salt and pepper. Using a vegetable peeler, shave the zucchini and yellow squash until you reach the core. Discard the core with the seeds. Toss together the shaved zucchini and yellow squash with the dressing. Set aside. Melt butter, garlic and parsley in a small saucepan over medium heat. Set aside. Brush 1 tbsp olive oil on both sides of the sea bass. Season with lemon pepper and salt. Grill fish for 7 minutes. Flip and brush the melted butter onto the fish. Cook for another 5-7 minutes or until fish flakes easily with a fork. Remove from heat. Assemble the plates. Place zucchini and yellow squash salad on the bottom, followed by the sea bass and the grape salsa. Serve immediately. Sea bass is probably my favorite fish of all time. The flesh is flaky, juicy and succulent – if cooked probably. 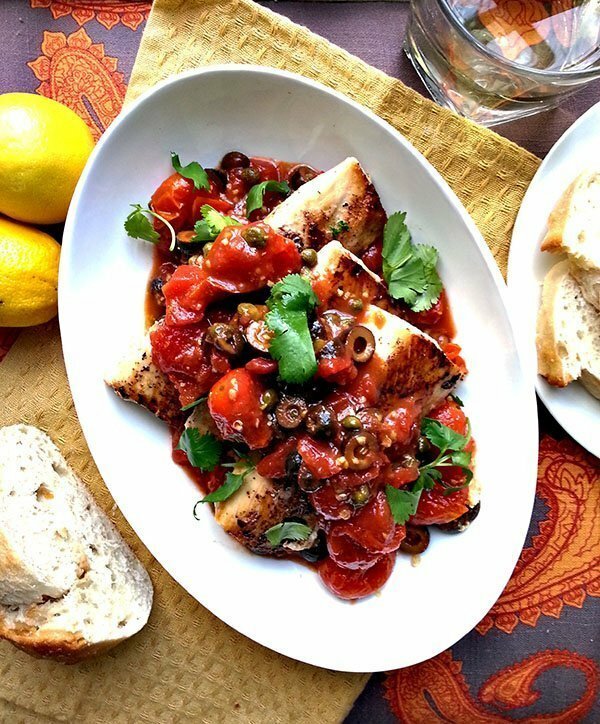 Just like halibut, (which would make a great substitution for this dish), it can be easily overcooked so keep your eye on the grill when preparing! To test if your fish is ready, grab a fork and see if it can be easily flaked. If the flesh falls apart easily, it’s ready to be consumed. 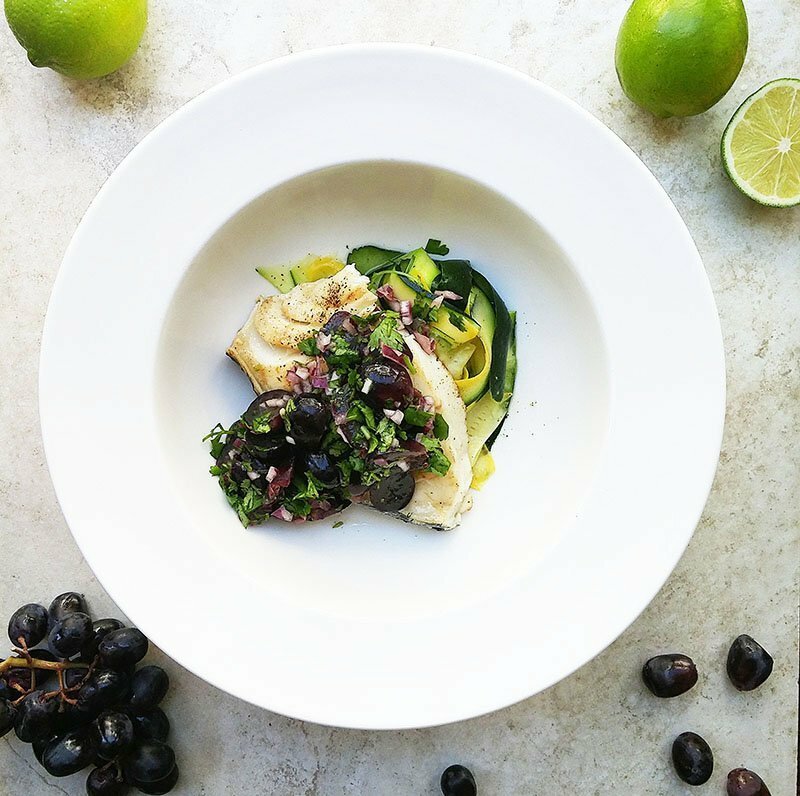 This sea bass with grape salsa comes together quickly. I personally prefer the sweetness of the red grapes as opposed to the tartness of the green grapes, but if you want more of a zing to your salsa, go for the green. The salsa and zucchini salad can be made ahead of time; this actually allows the flavors to meld together and will result in a tastier dish. 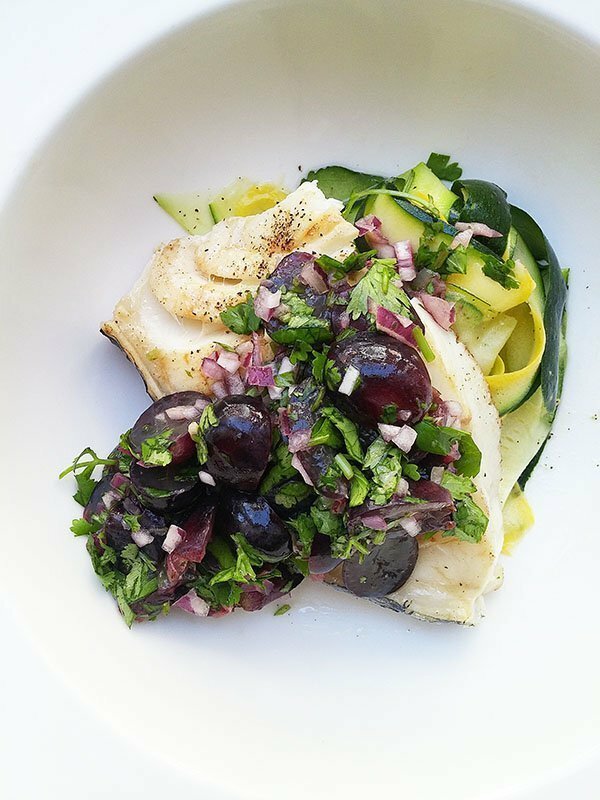 Grill the sea bass, finish with a little bit of butter and pair with salsa and zucchini salad. 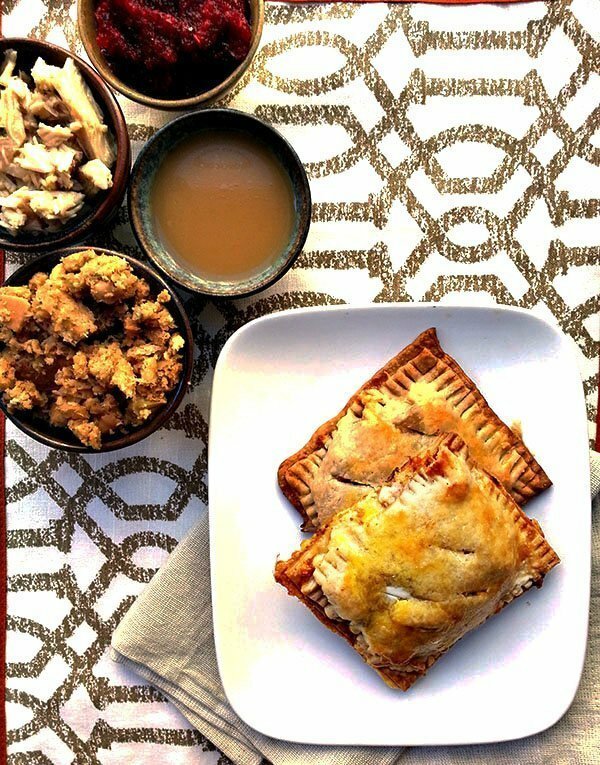 What can be better than a refreshing meal that’s light on the calories but still filling? I love how light but hearty this is! The grape salsa really gives some oomph! I just made some bass last night actually, but now I want to run out and get some more to try this recipe!